Browser Switchboard is a program which allows you to choose which browser to use as the default browser. It supports MicroB, Tear, Mobile Firefox, Opera Mobile, and Midori out of the box, and can also be used to launch MicroB without having browserd running. A Control Panel applet to choose the default browser is provided. In the Control Panel applet, only offer browsers that are actually installed. Fall back to MicroB instead of silently failing if the configured default browser is not installed. [Fremantle] An overhaul of the MicroB launching process, which should greatly increase the robustness of Browser Switchboard with MicroB on Fremantle. When MicroB is selected as the default browser, the user experience should be identical to that when Browser Switchboard isn't installed; MicroB will still behave differently when another browser is selected as the default (see the known issues for details). [Diablo] Continuous mode is now the default mode of operation. [Fremantle] Continuous mode is now forced on regardless of the setting of the config preference; this change is required to make sure applications can find us on the system bus. [Fremantle] Browser Switchboard is now started on startup; this change is required to make sure applications can find us on the system bus. [Fremantle] By default, MicroB is now prestarted on startup, and remains in memory even when no browser windows are open, if MicroB is the default browser. This behavior can be configured via a new autostart_microb preference. Update the package description to mention that there's a control panel applet in the package, to help out users who don't read documentation (and therefore won't find this thread). Thanks to Emanuele Cassioli for the suggestion. Rename the MicroB option in the control panel to "MicroB (stock browser)", as some have pointed out that the MicroB name isn't used anywhere and is therefore not familiar to many users. Better wording suggestions are welcome. Provide a command-line tool for configuring Browser Switchboard which can be used by browser developers to set their browser as the default. See the commit message for more information. This interface isn't set in stone, so if you have comments, please let me know. The recommended way to install Browser Switchboard is via the Maemo Extras repository, which is enabled by default in the Application Manager. You should find Browser Switchboard in the Application Manager catalog under the network category. Alternately, if you're viewing this page on your Maemo device, opening the one-click install will install the package from Maemo Extras for you. Source code and packages can also be found on the Maemo Garage download page. Just open the one-click install in a browser on your device and follow the instructions to install Browser Switchboard. Download the binary package: browser-switchboard_X.Y-Z_all.deb (where X.Y-Z is the version number, of course). Install the package using the Application Manager. You can now select the default browser by using the Browser Switchboard applet in the Control Panel. Links in most applications, locally-saved web pages opened from the file manager, and (for Maemo 4.x) entries in the Web sidebar panel will open in the browser that you select as the default. Opening the "Web" menu entry and running "browser" from the shell will also cause your chosen default browser to open. If you don't configure a default browser, MicroB will continue to be used as the default browser. 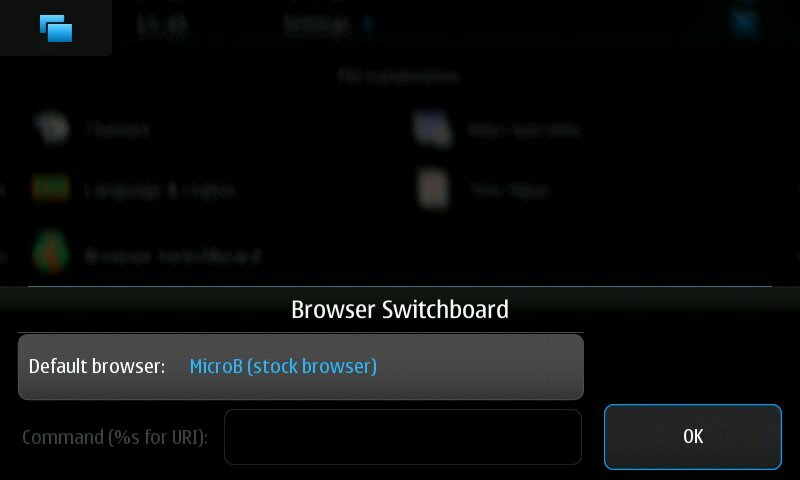 No matter which browser you select as the default, MicroB can always be opened via the MicroB menu entry in the applications menu (for Maemo 4.x, installed in the Extras menu by default), or by running "microb" from the shell. While MicroB is open, it will receive all links from other applications; closing MicroB will restore your chosen default browser. If you experience trouble after installing the package, try rebooting your device. If that fixes things, please report this as a bug. See the README for further instructions on how to configure and use Browser Switchboard. You can email your question to the maintainers (see below), or you can take it to the Browser Switchboard thread on the talk.maemo.org forums. from a shell. You can also browse the repository using gitweb. Bug reports and patches can be emailed to the maintainers, or posted on the forum thread. Steven Luo <steven+maemo [at] steven676.net> is the primary maintainer of Browser Switchboard, with assistance from Jason Simpson (the original developer).